One of my favorite things in the world is just a good, no-frills, meat loaf and here it is: Chili-Glazed Meat Loaf. 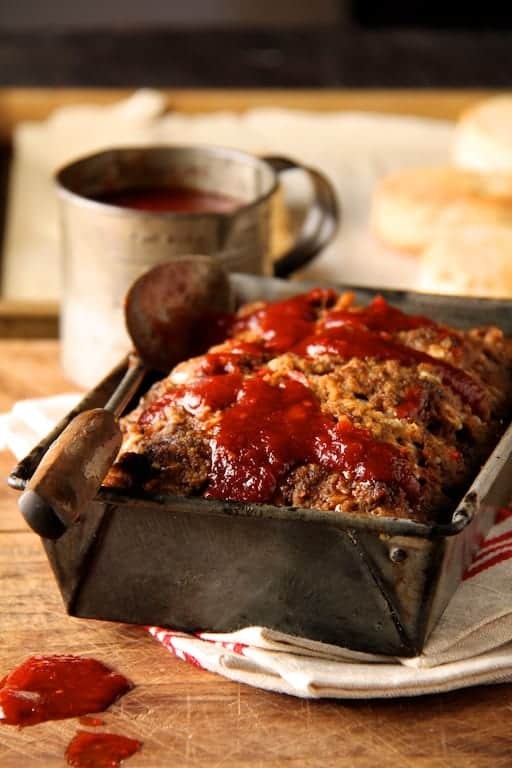 This meat loaf is also a client favorite! Now don’t get me wrong; I love bacon. Meat loaf is considered to be an American invention, however, the concept of combining ground meat with other ingredients and then cooking them together in loaf form goes back centuries. Meat loaf became popular in this country around World War II as a thrifty way to use up ingredients before they spoiled. When I prepare meat loaf, I get all the ingredients besides the meat mixed together first so they’ll be more evenly distributed throughout the meat loaf. I then put on disposable gloves and mix everything together with my hands. To bake in a pan or not to bake in a pan is often the question. I’m a neat freak and meat loaf drippings can spatter all over the oven, so I opt for the pan. As soon as I take the meat loaf out of the oven, I immediately drain off any drippings then let it rest about ten minutes before slicing it. It’s just the two of us around here so when I reheat the remaining meat loaf in portions, I prefer it not be dry. The only way to tell if a meat loaf is fully cooked is with a good meat thermometer which should register 165 degrees. Some mashed potatoes and a green veggie and you’re good to go! I love meatloaf and am forever tweaking my recipes. I have not tried chili glazed yet, but will need to pin this for next time. I always use a pan as well. Wow, what a great looking meatloaf. I bet that chili glaze adds an awesome kick to it. This would totally be a winner in our house! When it comes to dinner, I love nothing more than meatloaf! I’ll definitely be making this on Monday, since Wednesday is when Lent begins and I’m giving up meat this year. Got to get my fill of delicious meats in beforehand! I’ve never been much of a fan of meatloaf, but I think this post may have converted me! Your chili glazed loaf looks so flavoursome, spicy and delicious. Great picture! That looks yummy. When I was a I worked at a cafe where I made the meatloaf. Something satisfying about getting mixing everything up by hand. We baked the meatloaf on baking trays (this was meatloaf for thirty after all) and I loved patting it (a hard slap really) into shape.